Upping sticks from the UK to a far flung corner of the World is an exciting but somewhat challenging business. There are many things to consider – from sorting visas and bank accounts to arranging travel and removals. You may have a huge array of furniture and personal items you’d like to take with you overseas – and that means arranging the shipment of these precious items. 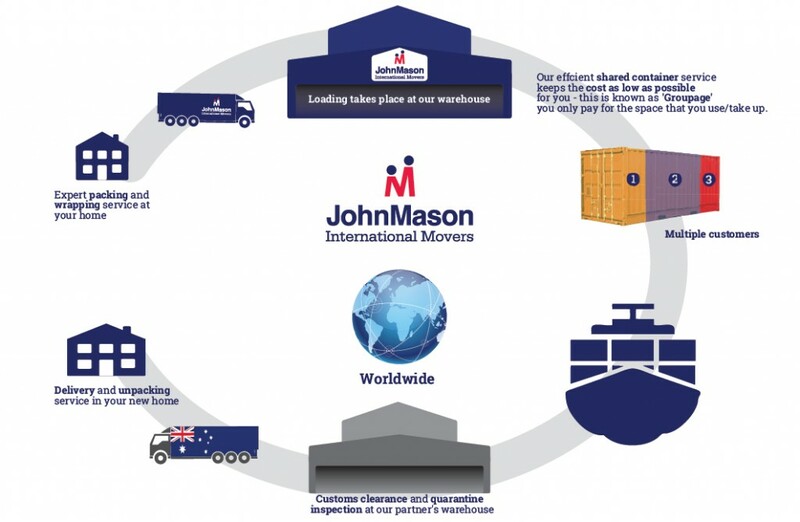 Specialist international removals companies like John Mason International can arrange this very important process, securing large shipping containers to take the whole lot abroad in one go. Interestingly, distance isn’t a clear indicator of cost. In fact, sending your belongings to Australia is less costly than moving them to some other destinations. Regardless of your country of choice though, there are ways to make savings. You can choose from different sizes of container. Perhaps you’re taking everything but the kitchen sink and need a 40 ft one – or maybe you can make do with a 20 ft box. But what if you only have enough items to fill half or part of a container? Groupage – or sharing a container – side steps the need to pay for more space than you actually need. The process involves partnering with those in a similar situation – people travelling to the same destination without enough items to fill an entire container. “We’re always on the lookout for ways of reducing the cost of moving for our customers – and Groupage is a very good example of that,” says John Mason International director Simon Hood. “It is very cost-effective – far cheaper than taking out a whole container you just don’t need. We’ve had a lot of success when combining customers’ belongings to make up a whole box. Transit can take a little longer because we have to match shipments and pack them together before departure – but the feedback we’ve had from those who have taken this option has been overwhelmingly positive. Book a survey or contact us for more information about which service would be more cost effective for you.